Can't tell, do the plants have both male and female flowers? If yes, maybe you are have a pollination problem. Have you seen any bees out working? Those flowers that you have shown do look very much like Male flowers only. Check with the above site to make sure you have got some female ones on your plant. Agree with above. 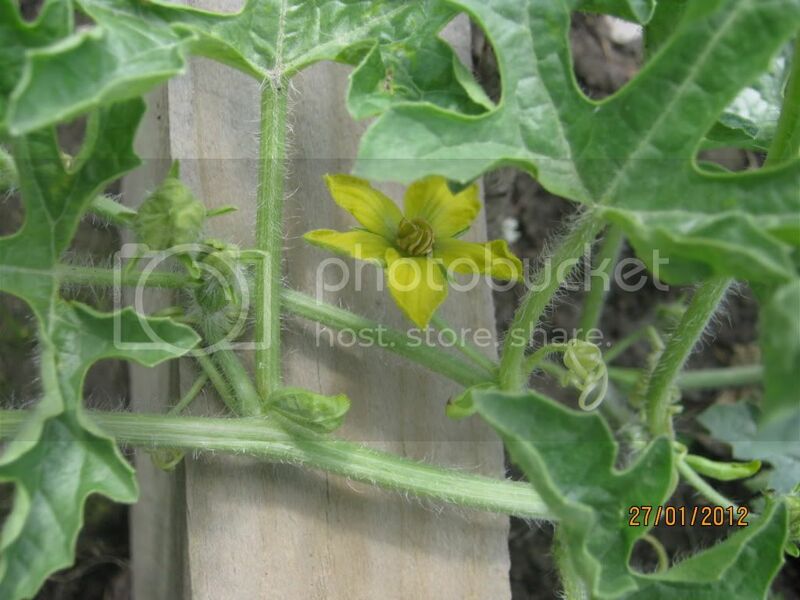 Cucurbitae, that is squash, pumpkins, watermelons, etc, have separate male and female flowers. The pollen has to get from the first to the second, usually by bees. You can identify the female flowers, because they come with a little embryo fruit behind them. It is not uncommon for them to produce only male flowers for the first couple weeks that they start blooming. One theory is that this helps attract the bees so that they are on the job and ready when the females appear. If you have male and female flowers and bees or other pollinators around, you won't need to worry about hand pollinating... nature will do the job. One meter is still a very small young watermelon plant, unless you are growing some dwarf variety. Remember this thing is going to get huge! You need both the female and male flowers for your melons to pollinate,i hand pollinate mine even though their are plenty of pollinators around my area and you usually only have 1 day to do this. The female flower will have a tiny melon at the base of the flower and the male just has the flower so its very easy to tell the difference. To hand polliate you can pull the male flower from the plant and pull off the petals and the gently dab the flower into the center of the female bloom several times or you can use a tiny paint brush and you want have to remove the male flower. The male and female flowers when they bloom generally on stay opened up for about a day so you need to keep an eye out if you go that route. Also if the plant has just started blooming they usually only produce male flowers for the first few weeks so be patient and remember if your vines are only a meter long they will get much bigger. I also cut off any weak vines and leaves that look like they mite carry diseases to keep from spreading across the entire plant but you can do your owm research on that and see how you wanna do it. Hope this helps.